Fashion and glamour industries are surely breaking stereotypes in style. Be it transgender models featuring on magazine covers, men featuring in cosmetic ads, acid attack survivors walking down the ramp and much more, things are changing for good. Now, in another great move for the first time, a differently-abled woman participated in the Miss World contest and it’s a huge deal, The Indian Express reports. 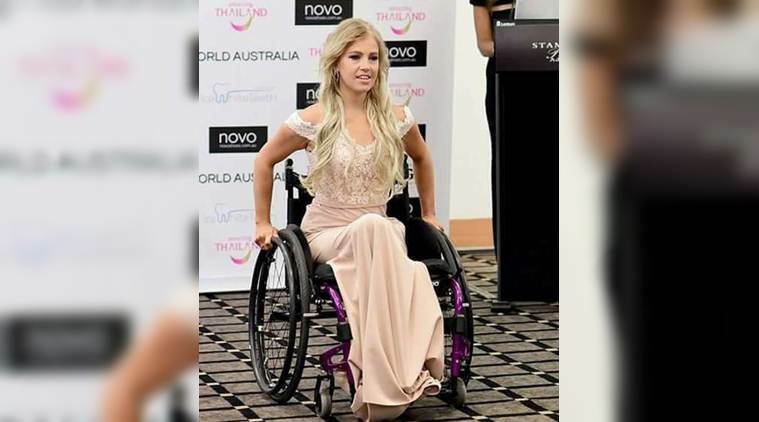 Justine Clark made history as she became the first Australian woman in a wheelchair to compete in the Miss World Australia contest on Sunday (February 19). With a dream to make the runway an ‘accepting place’ for all women, irrespective of size, colour, race, the 26-year-old inspiring women graced the catwalk in the state’s finale in Adelaide. The gorgeous beauty, who suffers a “lower leg deformity”, was keen to be involved with the competition due to their “Beauty With a Purpose’ movement – a mission to benefit “the most vulnerable in our society”, the Daily Mail, Australia reported. “I want the catwalk to be a fair and inclusive place for everyone. A wheelchair does not define me or limit me. I can still be strong, feminine and beautiful,” the confident Clark told the Daily Mail. The inspiring blonde beauty has been wheelchair-bound for two years but she wouldn’t reveal the circumstances that changed her life. “I don’t really want to go in to what happened but I want to be a role model and empower young women,” Clark said in an interview to The Advertiser. “For somebody in a wheelchair to be able to compete is a big thing. I really hope it sends a message that no matter what your race, size or disability — whatever makes you different — you are beautiful,” the news organisation added. Commenting on Clark’s participation, Miss World national director Deborah Miller said her involvement in the pageant showed that “beauty comes in all forms”. However, the 26-year-old aspiring beauty queen did not make it to the next stage of the competition. The competition will raise money for Variety, the children’s charity with the highest South Australia fundraiser and it is believed that it was the high percentage of disadvantaged children in wheelchairs South Australia that truly motivated her interest in the contest. The spirited young woman wants to continue working with Variety and spread the ‘Beauty With a Purpose’ message.